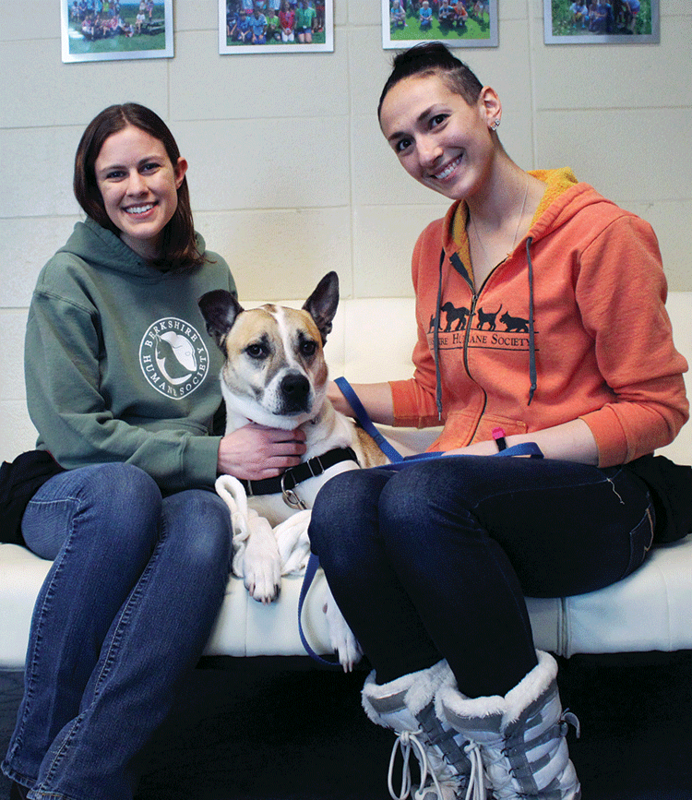 Canine Adoption Counselors Laura Mertzlufft and Stacey Broderick sat down for a warm, candid conversation about their work in the bustling kennel at BHS in Pittsfield. Both are devoted staff members who love their work and cherish the dogs they care for. Describe your job in the kennel. Laura: Caring for the animals. That’s the primary task. At the beginning of the day, we do a lot of clean up. Stacey: There is a lot of poop to clean up. Laura: It’s unreal! We do have volunteers that help. Part of our job is to manage the volunteers. Once morning clean up, walks, and feeding is done, we try to catch up on phone calls or situations that have come up. Emergency surrenders always take priority. Usually by this point, the shelter is open. When people come in, we’re out on the floor doing adoption counseling, helping people with the application, and answering questions. We spend a lot of time talking about training, temperament evaluations, and helping make sure an adoption is the right match for a person’s lifestyle. If we have a spare second, we check our email. When we’re caught up, we work on play-training and one-on-one enrichment, socialization, confidence-building. We’re multi-tasking all the time! Stacey: Especially with the transports, when you have to bang out multiple Safer Tests at a time. Then you have to complete personality assessments and color-code everybody. After that, the dogs need baths, nail trims, ear cleaning. And we check everyone to see if any vet assistance is required. We work hand-in-hand with local vets. They are awesome. What is a Safer Test? Stacey: A SAFER (Safety Assessment for Evaluating Rehoming) test pushes the dog to its comfort limit. We look for body sensitivity by touching them all over. We test for resource guarding, and any aggression toward people, children, other animals. Children are often at eye level with a dog, so if the dog nips, it would likely go for the face because it’s right there. We want to make sure that’s not going to happen. Laura: A big part of our job is educating people about safety, both volunteers and potential adopters. We have a whole lesson dedicated to body language and recognizing stress signals, and how to provide outlets for stress; how to recognize actual aggression. It’s second nature for everyone who works in the kennel. We’re always reading what a dog is saying with its body language. Stacey: Most people have been told, when you first meet a dog, give your hand to sniff. That’s absolutely, 100% false. Please don’t stick your hands in dogs’ faces. It’s invasive. We don’t do that to humans. Respect the dog’s space and calmly kneel down next to them, let them come to you. They get to determine the pace. Laura: Stress is cumulative, just like in humans. There’s a breaking point. A human might yell. For a dog, a trigger could be a man who is wearing a hat, and then suddenly the dog hears a new noise. Stacey: The man is wearing sunglasses! Laura: Right. It’s like, BOOM. The dog can’t handle [the stimulation] anymore, so they might nip. This is why we take safety so seriously. How many dogs do you care for? Laura: There is such a huge variation. Last week we had six, which was amazing. Stacey: We worked on enrichment. They got to run around the pen. They got more one-on-one attention. Laura: Those days are especially rewarding because you can see how much progress they can make so quickly. If we’re completely full, our capacity is about 27. What makes your job special? Stacey: I get to play with dogs all day long! You clean up a lot of poo and you have to deal with a lot of yucky, gross stuff, but knowing that you’re doing something good for the dogs and the community makes it all worthwhile. We’re all about the animals here. I love them. I really do! Laura: It is very rewarding. One of my favorite things is working with shy dogs. Seeing them grow and come out of their shells. It’s amazing! I can’t even put it into words. When I send them home, I have to hold back tears. Are there any special dogs you’ve seen transformed? Laura: Target was here for a long time. He was extremely fearful and sensitive. We did the standard procedure for confidence-building, but the poor baby reverted backwards. His mental stability really took a turn for the worse. He stopped eating. Maybe we moved too fast for him. One day before we opened, we worked with him using really high value treats. We all sat down and gave him the choice to get the reward, which we put at his comfort threshold. By the end of that session we were walking him through doorways and into new spaces. That was a turning point. And the family who adopted him was willing to take on a labor intensive dog. They knew it was worth it. Stacey: Tiger, who was recently adopted. He’d been bounced around from shelter to shelter, and he was sedated when he arrived. He definitely had a wild child streak. He was reactive to everything. We worked with him, got to know his personality. He was stoic. He was never going to be warm and cuddly, until he got comfortable. But he got better, and starting doing well, even with kids. Laura: Obviously, we’re huge advocates for adoption. You’re giving an animal a second chance. A huge advantage is that we know their behavior and personality, and they come fixed with all their shots. Stacey: They are microchipped, and we send them home with blankets and toys. We also offer dog introductions, so if you have a dog currently, you can bring them here and we can safely conduct the first meeting. Also, become a Compassionate Caregiver! That helps us every single day. Donations allows us to buy the supplies that we most need, things that you might not be able to buy at regular stores. Laura: Physical donations are always helpful. We always need cleaning supplies. Bleach, laundry detergent, paper towels, toys, treats, blankets. Poop bags! Stacey: Yeah, once you put the treats in, they do come out.